Several years ago our extended family traveled together to the Grand Canyon. It was my third time to experience the majestic grandeur and glorious beauty of this wonder of nature. On my first visit, I experienced the canyon from the rim. On my second visit, with a group of college classmates including my future wife, Melissa, I hiked the Bright Angel Trail to the point overlooking the Colorado River, a 12-mile round trip. On my third visit, I joined my brother and sister-in-law on an overnight journey that took us all the way to the river. While hiking into and out of the canyon is both an awe-inspiring and physically challenging experience, I find myself today reflecting on an experience that happened on the rim of the canyon during my third visit. We traveled one evening to an overlook known for the spectacular vista offered at sunset. We found ourselves in the midst of a large collection of individuals and families, people of all ages and stations in life, who had come to this moment from all over the world. Families enjoyed picnics. Young children played tag. Teenagers threw Frisbees. Young couples shared wine and cheese. Blankets were spread across the overlook. Older people sat in lawn chairs. The atmosphere was festive, with the sights and sounds of human joy. As sunset approached, people gathered near the edge of the overlook in anticipation of the mysterious glory that accompanies the setting of the sun. And then the sun began to fall beyond the distant rim of the canyon, until finally, it was out of sight, leaving only the brilliant colors of the sky at dusk. In that moment, I realized the festive sounds of human joy had given way to something altogether different; the reverent silence of human awe. The sounds of laughter and play, even of an infant’s wail, had disappeared, replaced by the sound of silence. We live in a time characterized by noise. There is the manufactured noise of machines that rob us of silence. There is the noise of human emotion, too often marked by fear and anger, frustration and unease, greed and pride; noise that shouts out as if it will never be heard. There is the noise of the electronic age, marked by pinging inboxes, or by pundits trying to out-scream one another on the talk shows. There is the noise of our own inner lives, revealing what Augustine called hearts that are restless until they find rest in the divine. In all of the noise, we drown out the truly urgent sounds of an angry world, sounds born out of injustice, violence, fear and human despair. In such a world, we might all benefit from the sound of silence. In such a world, we might all benefit from those moments that transcend our restlessness and bring us peace. In such a world, we might all benefit from more time spent in the God-given beauty of the natural world. While winter has held an unusually tight hold this year, spring is beginning to blossom, and summer is around the corner. We don’t have to travel across the country to experience the awe-inspiring beauty of nature. Delaware County has more waterfront than any county in Ohio. Hiking trails are abundant. Mountains are not far away. Perhaps the arrival of spring and the promise of summer call for a new season’s resolution – to take time to experience the glory of a sunrise or the beauty of a sunset; to take time to escape the noise; to take time to listen for the sound of silence, known to some as the sound of a still, small voice; to find the peace that passes all human understanding. It is that peace that sustains us. It is that peace that empowers us. It is that peace that brings hope to a broken and hurting world. 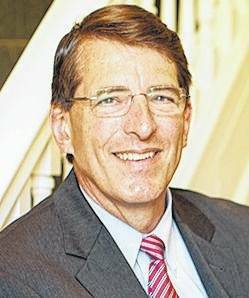 Rock Jones is president of Ohio Wesleyan University and an ordained elder in the United Methodist Church.